Spring Water - Bottled water derived from an underground formation from which water flows naturally to the surface of the earth. Spring water must be collected only at the spring or through a borehole tapping the underground formation feeding the spring. Spring water collected with the use of an external force must be from the same underground stratum as the spring and must have all the physical properties before treatment, and be of the same composition and quality as the water that flows naturally to the surface of the earth. Purified Water - Water that has been produced by distillation, deionization, reverse osmosis or other suitable processes while meeting the definition of purified water in the United States Pharmacopoeia may be labeled as purified bottled water. Other suitable product names for bottled water treated by one of the above processes may include "distilled water" if it is produced by distillation, deionized water" if it is produced by deionization or "reverse osmosis water" if the process used is reverse osmosis. Alternatively, "___ drinking water" can be used with the blank being filled in with one of the terms defined in this paragraph (e.g., "purified drinking water" or "distilled drinking water"). Mineral Water - Bottled water containing not less than 250 parts per million total dissolved solids may be labeled as mineral water. Mineral water is distinguished from other types of bottled water by its constant level and relative proportions of mineral and trace elements at the point of emergence from the source. No minerals can be added to this product. Sparkling Bottled Water - Water that after treatment, and possible replacement with carbon dioxide, contains the same amount of carbon dioxide that it had as it emerged from the source. Sparkling bottled waters may be labeled as "sparkling drinking water," "sparkling mineral water," "sparkling spring water," etc. Artesian Water/Artesian Well Water - Bottled water from a well that taps a confined aquifer (a water-bearing underground layer of rock or sand) in which the water level stands at some height above the top of the aquifer. Well Water - Bottled water from a hole bored, drilled or otherwise constructed in the ground, which taps the water aquifer. 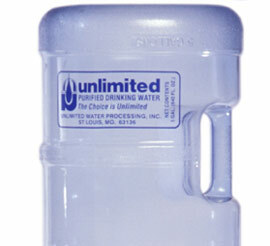 What type of bottled water does Unlimited Water provide? 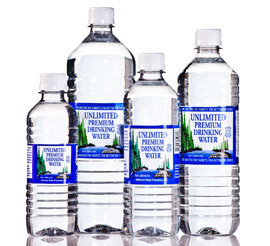 Unlimited Water Processing specializes in Spring Water, Distilled Water and Purified Water. We provide a wide variety of packaging solutions depending upon your needs. Please contact customer service for more information. 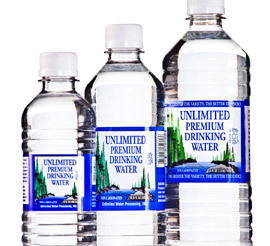 Does Unlimited Water meet strict quality standards? Unlimited Water Processing plant facilities exceeds federal, state and local requirements. From the source, the water, the bottle, the label, the plant, the cap and even the seal, our water exceeds strict federal, state and industry standards. Most certainly. The bottled water industry is regulated on three levels: federal, state and, for members of IBWA, at the industry level. Unlimited Water is a member of IBWA. FDA regulations, coupled with state and industry standards, offer consumers assurance that the bottled water they purchase is stringently regulated and tested, and is of the highest quality. IBWA has been a long-standing proponent of sensible regulations for bottled water that help to further ensure safety and protect consumers. IBWA is active at all levels of local, state and federal government, assisting in the development of such regulations, where they help enhance public safety and product quality. Drink at least eight 8-ounce servings of water each day. The more active you are, the more water you need to replenish lost fluids. Which types of delivery does Unlimited Water Processing provide? Unlimited Water services both home and office delivery. We have been providing water for over 20 years to commercial and residential areas. Our customers range from familes of four to Fortune 500 companies. How much water will my company need? 10-15 Employees... start with three 5-gallon bottles per month and make adjustments according to actual consumption. 15-30 Employees...start with five 5-gallon bottles per month and make adjustments according to actual consumption. 30+ Employees... start with two 5-gallon coolers and ten refillable 5-gallon bottles for up to thirty people; additional employees may require additional coolers and water bottles. Our customer service representatives can help you determine the appropriate amount. How much water does my family need? For a family of four that uses water for drinking only, we recommend starting with four 5-gallon bottles per month. During your first month, you can determine, more precisely, your family's level of consumption. If your family uses bottled water for cooking and juice, as well as drinking, we recommend starting with five or six 5-gallon bottles per month. To what areas does Unlimited Water Processing deliver? Unlimited Water primarily focuses in St. Louis, St. Charles, and Southeastern Illinois areas. Who should I contact for delivery service? Please contact our 24-hour customer service.